Wow. Where to start? As I told you in the last post, I went to Cali a few weeks ago and one of the things that was on my to-do list was to visit Michael Jackson's resting place. Now if you know me, then you ALREADY know..this was something I had to do. So without going into too much detail, I just want you to remember this as I jump into this blog. It was one of the most surreal unexplainable moments I have ever felt. If you go back through my blogs, you will understand how much I looked up to Michael Jackson and the impact he had on me and my own career. BUT ANYHOO... This blog ain't about all that.. but what it is about is a tribute to the King of Pop. 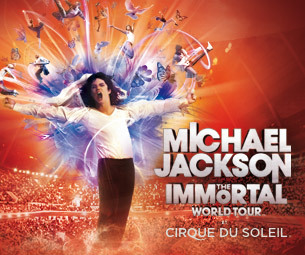 I had the opportunity to check out Michael Jackson: The Immortal World Tour by Cirque Du Soleil and I have one thing off the top to say: THIS IS HOW YOU DO A TRIBUTE! Everyone that has tried.. and plans to do one..see the show and take notes!! I'm not going to give the show away, but I wanted to tell ya'll a couple things about the show. This show embodied his spirit. His essence. His message. His music. The show reminds me of a story, a very familiar story. The story of magic, the story of wonderment, the story of curiosity, the story of life. What do you mean Meik? I'm glad you asked! Stick with me on this.. The show revolves around MJ's music, dances, videos, just everything MJ. Throw in some acrobatics, some theatrics, with a little dash of walking down memory lane, and you have a magical performance. I'm gonna hit some highlights that stood out for me. The show centers around a Mime, and everyone has their own interpretation of his presence, but to me, he represents the spirit of the King of Pop. He takes you on a journey from outside the gates of Neverland, to inside where the magic happens. From celebrating MJ's love of animals, to reminiscing on the Jackson 5, to his strong plea to help save mother earth, the show is jam packed. The show reminds me of going down the yellow brick road to see The Wiz or if you're extra fancy, The Wizard of Oz...except you never get to see the Wiz, instead you just hear his voice throughout the ranch aka show. Each performance is like looking into different rooms at Neverland and seeing an interpretation of those MJ classics we all know and love. If you've seen "This is It" then a lot of the scenes in this show will be very familiar. I can't tell you how many times I had to blink away the tears upon realizing just how awesome this show is and how some of the scenes he created for the tour were supposed to look, but one thing is missing. Michael. For me, this show hit home, because just a couple of weeks ago, I was clinging to the door of the Mausoleum where he was laid to rest, and then at the show, I realized, he is physically gone from us, but his spirit lives on. His music lives on. I looked around and as the song "Black or White" played, I noticed, everyone of all shades, were united, singing and crying. MJ's music did that.. he united people from different backgrounds. Michael's message of LOVE was also present, with artists from the show holding red glowing hearts that conjured up MJ's spirit on stage as his image appeared on screen as he sang "I'll be There"..I tell you what...there wasn't a dry eye in the house. Just thinking about it now has me about to ugly cry again. BUBBLES. Now you know darn well you can't pay tribute to MJ without showing Bubbles the Chimp some love, and I thought this was done tastefully with a slight comedic tone..I absolutely loved this addition,especially when Bubbles and the Mime embraced at the end. "Human Nature" -one of my favorite songs, but I didn't quite get why the childhood MJ on the screen was Asian...if the paper I'm reading says MJ as a child sitting on the moon. blink. I'm just saying..*shrugs* and it hurt my soul to the core to hear a child ask his mother "Ain't this Chris Brown's song?" I just knew lightening was about to strike him down. Scream- I thought they could have done more, but they didn't so I am just going to leave it alone. My FAVORITE performances of the night: "Smooth Criminal," "I Just Can't Stop Loving You," and "They Don't Care About Us." "Earth Song" and "Will you be there" started the waterworks for me, and "I'll be There" finished it off. I loved these performances also. Another highlight: A one legged dancer. You have to see it to believe it and when I tell you he WENT IN HARD.. whew.. he was one of my favorite dancers! It was also exciting to see another familiar face...if you watched "The Jacksons: A Family Dynasty" reality show or have paid attention in their concerts in the past, including MJ, then you know this drummer: SUGARFOOT Moffett! That man is a beast on the drums! GET IT GET IT!! I oh so wished Orianthi was on guitar, but the chick that was on guitar Desiree Bassett..she and Tina Guo on Cello were the ish! Loved em! Lastly, if you have ever played the video game: "The Michael Jackson Experience" then you are good to go, you will recognize a lot of the dances, and have to literally contain yourself like I did to not bust out in the aisles and just twerk it hard like nobody's watching. My only real complaint for the evening: A lot of the crowd just sat there like lumps on a log, can you nod your head? Clap? Sing? SOMETHING?! The crowd didn't get it popping until after intermission and THAT is not how an MJ show is supposed to go. If I was flexible, and could dance without all my ailments, and could turn flips, or even hum halfway decent I swear fo gawd I would have auditioned for this show..
My advice: If the show comes to your city..GO SEE IT! It's worth every expensive penny to see a tribute fitting for a King.